The outdoor venue provides concert-goers a pleasant, natural surrounding to enjoy the sounds and visual excitement of various national recording artists. Architect: Richard L Bowen & Associates, Inc. Creating a custom designed tension fabric structure that is both durable and aesthetically dramatic presented a daunting task. Shelter-Rite® architectural fabric by Seaman Corporation provided the ideal solution. The owners of the Nautica Stage in Cleveland, Ohio couldn't be happier. Jacobs Investments Inc., owners and operators of the Nautica Entertainment Complex, wanted to improve on an existing site. 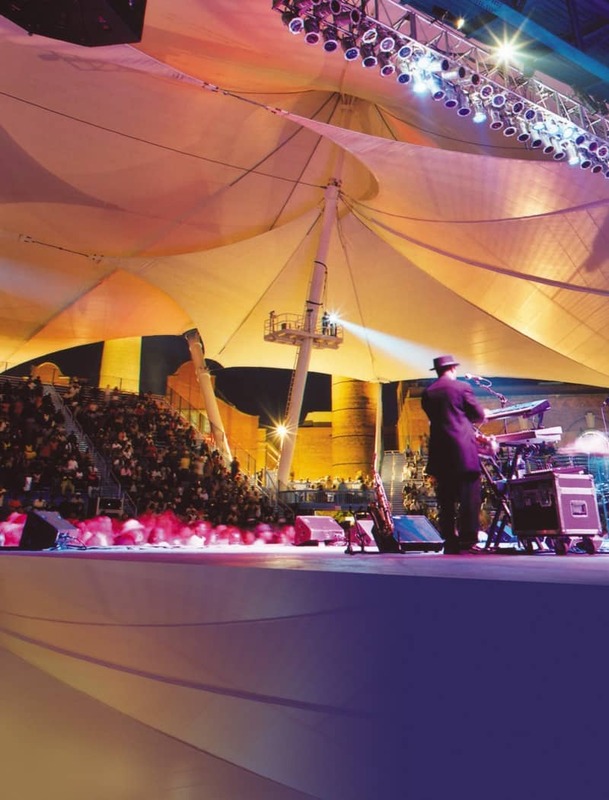 The outdoor venue provides concert-goers a pleasant, natural surrounding to enjoy the sounds and visual excitement of various national recording artists. Architects Richard L. Bowen & Associates Inc. were hired to develop a one-of-a-kind tension fabric structure that was both practical and uniquely beautiful. They in turn worked with Geiger Engineers to turn this vision into reality. The complex, located strategically on the Cuyahoga River bank and adjacent to the shores of Lake Erie, presented a difficult set of challenges. Because of its location, it was necessary to develop a system that would allow the material to be attached to the support poles before they were lifted into place. Shelter-Rite Style 9034 DC 184 architectural fabric was chosen because of the strength and flexibility it provides, assuring that it would stand up to these stresses as well as excessive winds and snow that are common to this locale. In addition, a Bright White fluoropolymer finish was applied to the top of the architectural fabric, making it virtually self-cleaning and resistant to the deteriorating effects of UV rays. In the end, more than 74,000 square feet of fabric was used. Another of the unique requirements of this venue was that, although natural light transmission from the sun into the stage area was desirable, in this case it was more important that the fabric be able to transmit maximum light from the inside out. Many of the featured performers put on dazzling light shows to accompany their music. The owners of the structure wanted to make sure that the beauty of the light shows projected through the structure out into the surrounding community. Shelter-Rite's DC 184 architectural fabric's unique qualities provided the ultimate in light transmission.